The Tiger Lillies are hitting the road and touring England for the first time in over five years! A highly visual nightmare and bizarre musical extravaganza which plunges plunge the audience into the dark and sinister world of Edgar Allan Poe. Video premiere: Is That All There Is? The Tiger Lillies are celebrating 30 years of their provocative brand of avant-garde punk-cabaret with their symphonic latest album, Devil’s Fairground (out 15 February). The video was directed by Anya Dimitrov, an artist based in Bucharest Romania who’s shot over 700 music videos to date. The Olivier Award winning Godfathers of alternative cabaret celebrate their 30th anniversary with a return season at Wilton's and the premiere of a new concert. Visit our shop for Christmas gifts! Give your loved one bad ballads and blasphemy! Buy any 2 cds (spend over £25) and get 1 cd free (double albums not included). Choose 3 albums and you will get a 100 % discount for the third one at the Checkout page. Join the Tiger Lillies for the final tour of 2018 as we head for Central Europe playing songs from the upcoming Devils Fairground Album. THE LAST DAYS OF MANKIND - DIGITAL ALBUM AVAILABLE! First published a hundred years ago, The Last Days of Mankind is one of the most important works by the uncompromising and fearless Austrian satirical writer Karl Kraus. The play was written in reaction to the horrors of the First World War and to highlight the widespread corruption and hypocrisy that brought an end to the Austro-Hungarian Empire. It used an innovative combination of textual collage, made up of quotations from political speeches, newspaper editorials and responses from the public, together with verse and comic interludes, to depict a society blithely marching on to its self-destruction and urged along all the way by big business, hapless diplomacy and a warmongering press. As an apocalyptic drama it is a fierce condemnation of events at the time, but has remained relevant ever since and has been adapted for stage and screen on many occasions. For the pan-European production at Edinburgh's Leith Theatre the Tiger Lillies were invited to perform alongside the actors, in a theatre space transformed into a turn-of-the-century Viennese cafe, and Martyn has also written new songs inspired by the biting sarcasm and absurdity, the black humour and inhumanity of the original. The album is available exclusively in digital download format. just add the album to the cart to receive a download code. If you bought code at a concert then input the code into ‘Apply Discount’ at the checkout. The Tiger Lillies in New York! The Tiger Lillies take a bite of the big apple this week when they perform their first shows in several years in New York City. The band will perform songs from their forthcoming 30th anniversary album. In this new show the Lillies take you on a trip in to to the Devil’s Fairground where temptation and sin await - will you survive to tell the tale or be seduced by the Golem? The gigs take place from the 2nd to 5th November at Joe’s Pub, on Friday and Saturday there will be two shows per night, booking links are on the TOUR section of the site. The Last Days of Mankind featuring The Tiger Lillies! In addition, the Olivier award winning cabaret artists The Tiger Lillies have written ten new songs for the production and will perform alongside the European actors in the magnificent Leith Theatre. Martyn Jacques’ new songs are inspired by the work of Kraus and will be performed by The Tiger Lillies appearing on stage alongside the actors. The auditorium will be transformed into a Viennese cafe with cabaret style seating evoking the atmosphere of fin de siècle Vienna. Martyn Jacques said he was finding plenty of inspiration in The Last Days of Mankind. ORCHESTRA SHOWS IN PRAGUE - NEW CD COMING SOON! On the 26th and 27th September in Prague The Tiger Lillies will perform two live shows and record a new album ‘The Devil’s Fairground’, performing with the contemporary Berg Orchestra. Inspired by the band’s wild nineties when Prague was their first foreign destination. The Tiger Lillies played to prostitues and gypsies in squats and pubs, they travelled around the whole of the Czech Republic, sleeping on people’s floors and writing the music that would eventually lead them to them becoming the acclaimed band they are today, touring all over the world. Featuring songs of nostalgia, irony, crude humour and immense beauty The Devil’s Fairground also celebrates the band’s 30th anniversary in 2019. With more than a year of collaboration between The Tiger Lillies’s lead singer and song writer Martyn Jacques and Michal Nejtek, who has created the symphonic arrangements, the result is a stunning and unique work which will be premiered at the Archa Theatre. Following the recording of Devil’s Fairgound the band will begin to premiere their new music in Romania, Austria, Switzerland, Croatia and in a long awaited return to New York where they will perform at Joe’s Pub at the beginning of November. The Tiger Lillies are back in Berlin! The Grammy nominated Godfathers of alternative cabaret are returning to one of their favourite cities - Berlin, to perform their only concert of 2018 at The Admiralspalast.The band will premiere brand new songs and invite you to take a trip into the Devil’s Fairground (their forthcoming new album) where temptation and sin await. The set will also include material from their most recent release Corrido de la Sangre and fan favourites from their 29 year-long career! 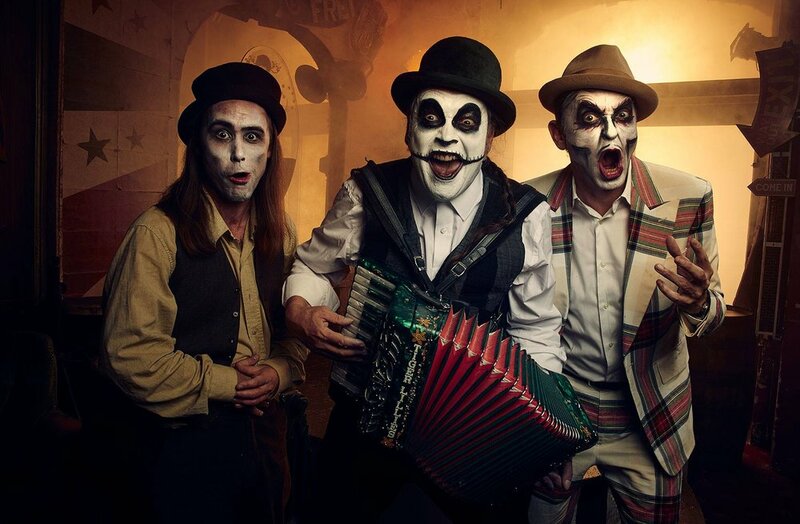 One of the most provocative and genre-defying bands you could come across, the world of The Tiger Lillies is dark, peculiar and varied, with moments of deep sadness, cruel black humour and immense beauty. Mixing pre-war Berlin cabaret with anarchic opera and gypsy music, their songs echo the voices of Bertolt Brecht and Jacques Brel. Performing all over the world the band has collaborated with circus performers and Shakespearean actors; experimental dancers and avant-garde photographers; burlesque puppeteers and classical music ensembles, winning an Olivier Award for their West End musical Shockheaded Peter along the way. A Mexican setting provides the backdrop for this brand new cycle of songs and its stage show, as the Tiger Lillies embark on a Latin vacation that takes a turn for the worst. An orphan, barely twelve years old, in a dusty, one-horse town... the beautiful Maria, and the drug baron who really shouldn’t have crossed her... strange, furtive rituals and mysterious characters who may be alive, or not, amidst the wild din of the Day of the Dead that swirls all around them... ¿que pasa? What can it all mean...? If only there was a glimpse of poncho and the stench of an evil-smelling cheroot we would know where we were, even a pocket-watch or a distant whistle on the wind... but no, that sound, it’s like Hell’s house-band is playing, and so it is: the Tiger Lillies are going down Mexico way. Seemingly abducted from their latest touring performances, the band, or perhaps it is the oddly familiar Los Flores del Tigre, wind up in a disreputable outpost near the Mexican border where the singer starts to tell his sorry tale. In these story-telling songs, his corridos, we hear about the tough life he suffered from the start, as a child accordionist playing bars to try and earn enough for a crust of empanada, before a couple of other lost mariachis joined him and together they were given an offer they couldn’t refuse: to sing the praises of the local drug lord. Older now, his heart is inflamed by Maria, who is also being kept at the hacienda, and in his youthful passion he resolves to free her and demonstrate his noble spirit. But Maria is also loved by the wicked crone, who lays a curse on our hero, and thus caught up in such a web of intrigue and emotion there is no escape for him and his compadres. Yet no story like this would be complete without revenge, and eventually we come to understand that the festival of the Day of the Dead is here to be taken very literally indeed. These songs of murder, retribution and lost love make up the album, which is also the soundtrack for the new, full-length stage show, “Corrido de la Sangre”, presented by HOME and given its world premiere on 20 April, the same day the album is released. The show features projected sets and startling visuals courtesy of regular Tiger Lillies amigo Mark Holthusen (Haunted Palace, Rime of the Ancient Mariner etc. ), alongside original music from the Olivier Award-winning and Grammy-nominated trio, widely celebrated and enduringly popular for their distinctive sound that marries high-art cabaret with sordid depravity. Martyn Jacques’s singing and performance on accordion, piano, harmonica, organ, ukulele or guitar is accompanied as ever by Adrian Stout’s multi-instrument playing, on bass, euphonium and musical saw, plus sepulchral backing vocals; drum duty is handled by Andreas Winter, with guest spots from Jacques and also Timm Brockmann, the master of the mix. For that essential extra quality, Christian Krille plays trumpet on just over half the tracks. The Tiger Lillies will perform a two-week run at the stunning Wilton's Music Hall in London this May. Performing material from their forthcoming album The Devil's Fairground, their new song cycle Corrido de la Sangre and classic favourites from their long career the Grammy nominated band will bring London's oldest surving music hall to eerie life. A Corrido singer and his band return from the realm of the dead to haunt their killer and tell us their dark story of intrigue, vengeance, murder and the mayhem of a romance gone bad. This new, full-length show blends stunning visuals with original music from the Grammy-nominated godfathers of alternative cabaret, The Tiger Lillies. Set in a small dusty town in the lands between Mexico and the US, the singer relays the tale of his rise and fall and the songs of life at the border, where mythical creatures from Aztec times still haunt the night. A new concert date has just been added for Christmas in Geneva, Switzerland at Salle de l'Alhambra. LONDON - SPAIN - FRANCE - UK! Throughout the Autumn and Winter The Tiger Lillies will be on tour throughout Europe with a whole host of shows and concerts.